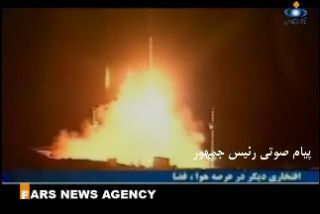 This still from a video by the Fars News Agency posted to the Omid satellite Web site shows the Safir-2 rocket launch in February 2009. Iran announced today (March 17) that it has launched a new rocket and space capsule designed to carry a monkey into orbit, according to the country's state-run news agency. According to Iran's official Islamic Republic News Agency, the country launched the capsule on a Kavoshgar-4 ("Explorer" in Farsi) rocket Tuesday (March 15). The IRNA report stated that "data and images" from the capsule were expected to be sent from orbit 120 kilometers (75 miles) above the Earth, Reuters reported. Although the new space capsule is designed to carry living creatures, there were no animals onboard this test launch, IRNA and other news agencies reported. Iran has launched a rat, two turtles and a worm on its Kavoshgar-3 rocket in February 2010, the nation said. In 2009, the Iranian space agency launched a telecommunications satellite onboard its Safir-2 rocket. The new space capsule and the Kavoshgar-4 rocket were both unveiled by Iran's President Mahmoud Ahmadinejad in early February, the Agence-France Presse reported. Ultimately, Iran has said it aims to launch a human into space by 2020, and to put an astronaut on the moon by 2025. The Islamic republic denies military motives for its space program, but Western nations fear that Iran is moving toward developing a ballistic missile capable of deploying a nuclear warhead. Last year's launch of the Kavoshgar-3 rocket prompted the United States to call it a "provocative act." Analysts say Iran's space goals are probably both scientific and militaristic, and the program allows the nation to build prestige among friends and enemies alike. "They will clearly use dual-use technology for a military buildup, and as long as they at least dabble in human spaceflight, they get advantageous press coverage on that as well," Joan Johnson-Freese, a professor of National Security Studies at the Naval War College in Newport, R.I., told SPACE.com in November. Before its recent series of successful launches, Iran reportedly had several rockets fail, including the first launch attempt of the Safir ("Ambassador") booster in August 2008. You can follow SPACE.com senior writer Clara Moskowitz on Twitter @ClaraMoskowitz. Follow SPACE.com for the latest in space science and exploration news on Twitter @Spacedotcomand on Facebook.